I was in Stratford this afternoon delivering my holistic massage coursework to the school. Afterwards, I thought I’d have a quick look at the new Westfields. Stratford – at least the stretch of concrete I know between the tube station and the Broadway – is urban jungle. A sort of larger, slightly newer Elephant & Castle. The demographic is different. Stratford is more New London, whereas Elephant is Old. Stratford is exclusively Eastern. The Asians, Africans, even Europeans are all Eastern. But apart from that it’s basically the same. But up an enormous flight of stairs towards the sky, across a wide, glass drawbridge which spans the metal moat of Stratford Station, is Castle Westfields. A City in the Sky to rival almost Canary Wharf, it shoots straight to the top of the Shopping Mall I’d Most Like To Be Holed Up In Come Dawn of the Dead chart. Westfields is an impressive construction. Presumably an enormous amount of money has been spent. The shops are impressive. The artificial streets twitter with the sound of artificial birds and artificial running water. Acceptable, middle of the road pop music plays over the PA. It is a place of clean, straight lines, metal, glass. And a sense of the great emptiness that is the Olympic Village behind it. 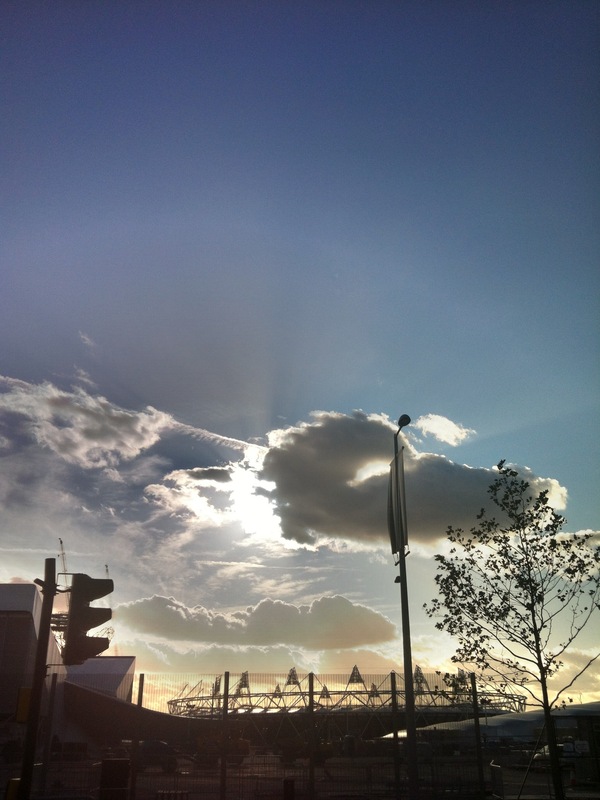 The sun was directly over the main stadium, which reminded me of the Millennium Dome. Closer to Westfields is a smaller stadium – the velodrome perhaps – which resembles a ziggurat in negative – the steps leading down into the middle. Here then is the architecture of the spectacle on an even grander scale than 1999. The sky above it was really quite something. 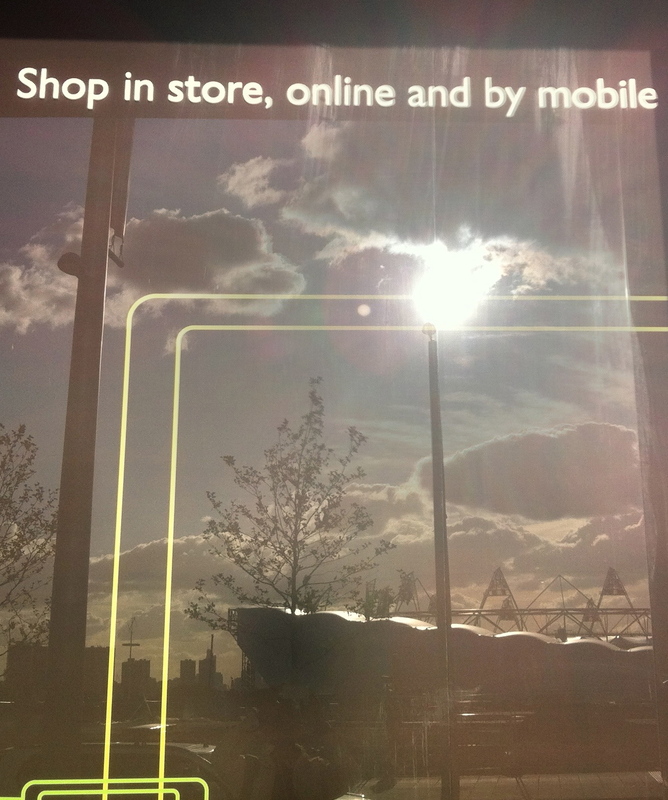 Reflected in the window of the giant John Lewis store, I thought it made for an ironic sort of shot. I had already been clocked by one security vehicle (hey, I haven’t shaved all week, I am quasi-bearded). Seconds after taking this shot another appeared and a Westfields Security Officer fitted out with full Agent Smith coiled earpiece got out and asked if I was alright. He wanted to see the pics on my iPhone (I’m going to have to give my photography secret away now) and for once the Top Camera app was playing up and it took a while for anything to show. Obviously I knew not to carry on in any sort of Al Qua’ida-ish way – managing to disguise my Yemeny accent and offering the observation that the Olympic Village under the distinctly weird sun was “glorious” rather than Zilzal-ish. If he had really drilled me I would have explained perhaps that I was taking an “ironic” shot for a blog which was kinda hot on irony, in an initiatic rather than postmodern way. But the shot itself seemed to satisfy him. He just wanted to check I wasn’t taking pictures of the cameras. That, of course, would have been a rather more ironic shot. I can see a whole series, whole blog dedicated to shots of CCTV cameras. Could be dangerous though. 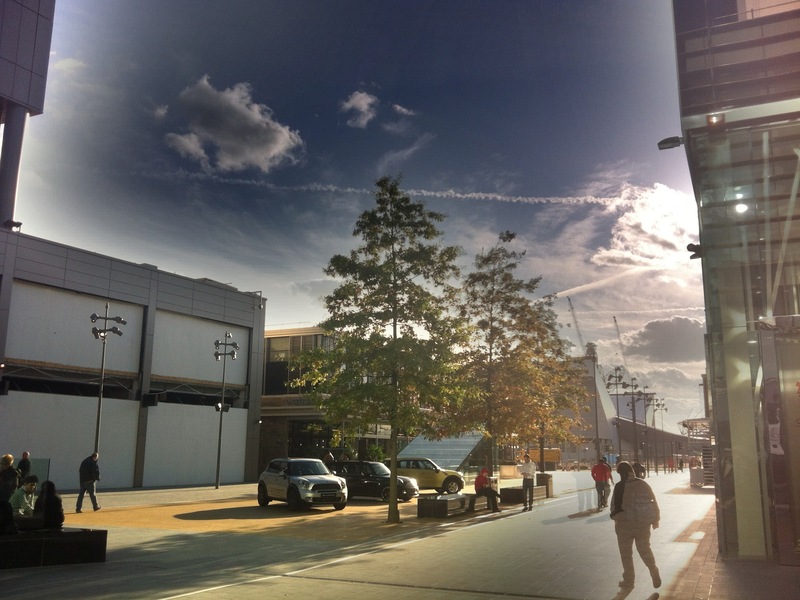 Pictures of Westfields were out then, but the Olympic Village was OK. I took a couple more, with him and the guy in the other jeep watching. Squinting touristically, and nodding at the pleasant impressiveness of it all. I went into John Lewis and had a cursory, decoy-ish glance through the kitchenware, wondering if the IOS 5 photostream already beaming out of my phone was tantamount to wearing the One Ring. I could feel the Eye on me all the way home.